It’s the law– home sellers are supposed to disclose any hazards to their property.The auctioneers selling properties in Gainesville Thursday– say that information was available on their website, but that doesn’t mean all potential buyers looked past the pictures. “I didn’t even know what they were protesting, do you have any idea,” said Keith Ingersoll of Orlando, who was attracted by the “income producing” residential real estate auction, and so were protesters. “I don’t know if they’re aware or not– but we just want to make sure that their investment is not going to be a sound investment,” said Maria Parsons, a protester with the Stephen Foster Neighborhood Association Inc. The two parcels up for grabs, sit beside the Cabot Koppers superfund site. Something protester Maria Parsons says, realtors haven’t been disclosing. “Renters are demanding that they will be let out of their leases…they have complained before the county and the city,” she said. The man with the mic says buyers are getting rent producing properties. “The superfund is not a big issue as I see it,” he said. But it is a big deal to the 15 Gainesville residents protesting. “I’m going to look more into what the superfund site is now that you’ve brought that to our attention…I’m actually going to speak to some of those protesters, figure out what they’re protesting,” said Ingersoll. Public speaks out at the ACBoB meeting June 14, 2011 in regards to the cancer study that the Alachua County Health Department published in June 2011. Roy speaks on June 14, 2011 to the ACBoC regarding the latest report from the Alachua County Health Department so called “Cancer Report” of the Koppers Superfund area. Published: Wednesday, June 15, 2011 at 6:01 a.m. Last Modified: Tuesday, June 14, 2011 at 4:40 p.m.
Cancer study results are no surprise I am a longtime resident of the Stephen Foster neighborhood who has been closely involved in the citizens’ response to the presence of dioxins in our environment from the Koppers Superfund site. 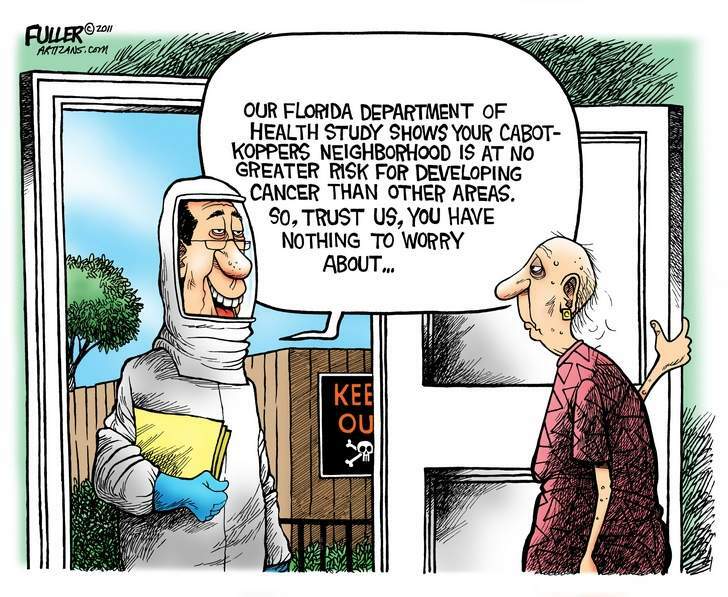 I am not surprised to hear that the Florida Department of Health has determined that people living in neighborhoods nearest Koppers actually have fewer cancers than people who don’t. It seems the department is implying that living near a heavily polluting Superfund site may actually be health-protective. I would love to believe that the dioxin found in our yards and homes really isn’t a highly toxic chemical with well-documented harmful effects. The Florida Department of Health has complete control over the data and has a strong legal interest in showing there is no negative health impact. This conclusion would be more believable coming from a neutral agency. This letter to the editor is in response to the Gainesville Sun published article titled “DOH: Koppers neighbors at no greater risk for cancer” dated June 3rd, 2011: Where the DOH did a cancer study basing most, if not all of it data on Census Records from 1981 to 2000 in the Stephen Fosters area ONLY and NOT the 2 mile raduis. There is no evidence to suggest neighbors of the Cabot-Koppers Superfund site in Gainesville are at an increased risk of developing cancer, according to a Florida Department of Health analysis released Friday. To bring attention to the ongoing contamination of the Floridan Aquifer by the Cabot/Koppers Superfund Site located in Gainesville, Florida, and to warn of the “Clear and Present Danger” this contamination poses to all of North Central Florida’s drinking water. To give a voice to generations of past and current residents and their testimonies of many cancers, other catastrophic illnesses, and the loss of family members and pets all due to exposure to the toxic chemicals emanating from the Cabot/Koppers Site in the heart of Gainesville, home to the University of Florida and the Gator Nation. Caution: Gainesville residents, visitors, and those considering residency, please be aware that our city is dangerously polluted! While receiving only inadequate and intermittant publicity over the years, the federally designated Cabot-Koppers Superfund Site has been steadily and cumulatively chemically polluting Gainesville to the point where the consequences of this toxicity can no longer be ignored, having become a serious threat to the future of Gainesville itself as a safe and pleasant place in which to live, be educated, and conduct business. Situated just northwest of downtown, the Cabot-Koppers Site was established in 1916 as a chemical wood treatment facility using the highly carcinogenic coal tar derivative creosote to treat telegraph poles and railroad ties. As decades passed, telegraph poles were replaced by telephone poles, and creosote was replaced by an even more deadly chemical cocktail: chromated copper arsenate, better known as CCA. Teratogenic and mutagenic as well as carcinogenic, CCA is now officially recognized as a major danger to public health by the US federal government. At present, toxic chemicals such as arsenic, creosote, dioxins and many other contaminants from Koppers are percolating into the Floridan Aquifer, which is the water source not only for Gainesville, but for all of North Central Florida. These chemicals constantly drain into the aquifer via a natural creek system that directly receives discharges of toxic water from the Koppers Site. Arsenic was discovered in the aquifer underneath the Koppers Site in 2003 at 30 parts per billion, which is three times the current Federal standard. Link to Document Click Here Recently, in spite of the fact that it violates the Clean Water Act, Florida DEP granted a permit to Koppers/Beazer enabling the polluter to legally discharge storm water into our creek systems, contaminating private properties along the way to the Haile Sink, which directly feeds into the Floridan Aquifer, the source of our drinking water. Link to Document Click Here And while Koppers ceased operations on the property in early 2010, its sister-company Beazer East began conducting ongoing activity including demolition and digging onsite in October, and is sending clouds of dioxin-laden dust through Gainesville’s neighborhoods. Landlords and Realtors’ Chronic Failure to Disclose Agent Orange and Other Hazardous Toxins. STUDENT RENTERS BEWARE — KOPPERS SUPERFUND SITE ALREADY IN A NEIGHBORHOOD NEAR YOU. : Ground Zero of a 2 Mile radius of cancer causing airborne toxins begins at: 2200 NW 23rd Avenue Gainesville and in one radian extends southwest to include a significant portion of the UF campus including several student housing apartment complexes and rental homes. Recent EPA approved scientific study concludes that DNA altering toxins have probably made entry into apartment complexes, homes, restaurants and businesses within a 2 mile radius in every direction from this infamous physical address in Northwaest Gainesville. These test results provide statistical certainty of wide spread toxic canamination even while the classrooms of nearby Stephen Foster elementary school have never been tested. VIDEO survey of residential area immediatel west of “ground zero”, Koppers Superfund site. For nearly a century, Koppers Inc. operated a 90-acre industrial facility at 200 NW 23rd Ave. The area has long been ranked as one of the nation’s top-100 polluted sites. In 1983, it was declared by the Environmental Protection Agency to be a Superfund site – a place so heavily polluted with toxic waste it is now known to pose a significant human health threat inside a majority of homes within a huge 13 square mile area of Gainesville and Alachua County. For decades, Koppers released industrial toxins into Gainesville’s air, water and soil, including arsenic, hexavalent chromium, creosote and dioxins. Combined, these chemicals are synergistically far worse than the sum of their individual toxicities with an ability to cause cancer, birth defects and alter the human genome is such a way as to predispose future generations to cancers and birth defects even though they never lived in Gainesville or the State of Florida. Currently, a pretentious 500-foot buffer around Koppers includes ABC Liquor, Ward’s Supermarket, the Salvation Army, a daycare center and many residential homes, which the City of Gainesville designated an “area of special environmental concern” in 2005. Today many of the homes are vacant due to death from cancers, mortgage default and others who evacuated on their own terms. After 26 years of stalling and complicity by the City of Gainesville, the floridan aquifer is officially contaminated with pollutants flowing north in the direction of the Murphree Wellfield where GRU draws the drinking water supply for Gainesville and numerous communities in Alachua County. Koppers has been the nation’s most stubborn deadly dump since it was designated by the EPA. Survivors are now fighting back to reveal Koppers as a national scandal and cover-up by the City of Gainesvillle, Gainesville Regional Utilities, Alachua County Government, local realtors and dark powers associated with the University of Florida. Beazer East, the Koppers holding company of interminable delay is charged with negotiating with the EPA to clean up the site. But while residents are pleading for emergency evacuation and relocation, Beazer has been allowed to slow-walk the cleanup just when the EPA is threatened with losing what little funding and authority they still have. The complicity of deadly inaction has been practiced by local government for decades – even when the EPA was sufficiently funded to protect Gainesville citizens. Until 2009 Koppers had been quietly licensed for operation, year after year. The City even supported Koppers’ economic success when they allowed GRU to sign a renewable contract for chemically processed utility polls. An apparent death wish toward their own ratepayers was revealed when contamination of the Floridan aquifer became a recognized threat to Gainesville’s drinking water at the same time GRU’s contract for Koppers significantly worked to Beazer’s advantage of strategic delay. Make no mistake – these are the victims of toxic contamination after they were victims of decades of lies and inaction by the City, County and GRU. Even Chris Bird’s environmental protection department has been constantly intimidated by City, County, and even University of Florida “bosses” into the inaction of silence. Today, Gainesville continues to permit new construction inside ground zero and landlords continue to rent without disclosing the danger to renters. The horrid cancer statistics suffered in silence by so many, are seldom reported by Gainesville Sun and WCJB TV – a conspiracy of unforgiveable complicity. The parents of thousands of UF and Santa Fe college students are never informed about Koppers Superfund site even while they plunk down thousands to house their sons and daughters in rentals and dorm style housing assumed to be safe from hidden dangers. Not one parent or student is made aware by realtors and landlords that significant health risks extend to a minimum distance of two miles from the Koppers dust bowl in every direction. Stephen Foster Elementary school sits virtually outside Koppers fence at ground zero but the school’s interior, classrooms and cafeteria have never been tested for dioxins or any other toxin on EPA’s long list despite the disturbing scientific sample data published last February. On February 15, 2011 the Bureau of Environmental Public Health Medicine in Tallahassee received conclusive data from the Calwell Practice of West Virginia establishing that deadly toxins from the Koppers Superfund site have contaminated the insides of structures to a minimum distance (radius) of two (2) miles from Koppers. The 233 samples were collected and analyzed under strict EPA protocol that employed rigorous analysis using two different labs. The revelation that Agent Orange type dioxins and other poisons have contaminated the inside of schools, homes, student apartments and businesses in a 13 square mile area of Gainesville, Alachua County and a portion of the UF Campus could easily be considered an environmental emergency. Instead, the Gainesville Sun shamefully chose to run a solid week of Osama Bin Laden myths in section A, above the fold. The disconnect of cowardice between the Alachua County Environmental Protection Department, Health department, School Board and local investigative news is nothing less than a deadly conspiracy of silence. On March 18, The Gainesville and Alachua County Area Realtors Association (GACAR) appeared to be yielding to the outcry from Koppers victims when they published a revised residential buyers disclosure form addressing the Koppers Superfund site. But GACAR’S flimsy disclosure refers to toxic risks in terms so vague there seems little chance that buyers will know just how deadly their purchase will be. Nowhere does the disclosure mention Cabot Koppers by name or address. More importantly any disclosure cannot be effective until landlords and apartment developers provide this explicit notice and information as to the nature and location of Koppers. GACAR’s online interactive form provides a few tedious links where buyers are presumed to have access to high speed internet service and understand how to negotiate the links to search for — scroll to, and eventually “discover” one of the most important lists of deadly and DNA altering toxins in the United States. ACDOH’s statement that residents in neighborhoods surrounding Koppers do not have an increased risk of cancer is irresponsible and misleading, and not only because of the cited study’s limitations noted by Dennis or, as Kline states, because the negative result is not a guarantee. The Cabot/Koppers site was not added to the federal Superfund program overnight or because of a whim on the part of the EPA. The NPL is reserved for the most malignant of sites posing a risk to public health. The Superfund/NPL designation was conferred here only after many decades of residents’ protestations and complaints of unusual numbers of illnesses and deaths, not just from cancers, but from conditions including and not limited to, respiratory diseases, immune system ailments, thyroid disorders, miscarriages and birth defects. The implication that contamination from the Site does not pose a health risk to Gainesville’s families only serves to lull residents into a false sense of security. We do not need reassurance or a coverup- we need an honest cleanup and relocation from our highly toxic homes. Hundreds of residents testifying over several decades give the lie to the official line that there’s no health risk. Finally, what’s more valuable: our money or our lives? Nearly three months have passed since Superintendent Dan Boyd and the rest of the Alachua County School Board received this letter on behalf of our children’s health and safety. So far, Boyd and his staff have failed to respond. At all. Alachua County parents are justifiably concerned for our children’s well-being, and our elected school board officials bear the responsibility of answering our concerns. Dr. Boyd’s stubborn refusal to address the extremely serious issues raised here is shameful and unacceptable. Parents have the right to complete and accurate data regarding toxins our sons and daughters may be exposed to in local schools. If you agree that Alachua County’s children deserve the same concern and protection of their health and well-being provided to other US children by their school boards, please email Superintendent Boyd at supt@gm.sbac.edu and demand the immediate indoor testing of all schools within a 2-mile radius of the Cabot-Koppers Superfund Site by a federally registered and approved testing firm. I write regarding the recent testing for soil contaminants on the grounds of just three local Gainesville public schools. There are approximately 12 public schools within a 2-mile radius of the Cabot/Koppers Superfund site. For example, Rawlings Elementary is as close to the site as Howard Bishop. Moreover, in other cities with superfund sites, the interiors of schools within a 2-mile radius of the sites were tested for contamination. Recently conducted tests for indoor dioxin contamination of local homes have yielded results that are hundreds of times higher than the results of tests for dioxin contamination in soil outside of these homes, and hundreds of times higher than the state sctl for residential soils (7ppt). Many of Gainesville’s dangerously contaminated homes are immediately adjacent to our schools and daycare centers! So why are Alachua County’s children being treated differently than children in other school districts containing superfund sites? Our children clearly deserve the same concern and protection of their health and well-being provided to other US children by their school boards. I cannot stress enough, just how crucially important it is to conduct indoor pollutants tests of our schools. This is only logical because students spend the majority of their time attending school indoors, not outdoors. Additionally, as you will know, soil on school grounds is usually replaced on a regular basis, rendering results of school ground soil tests inaccurate. Soil quality tests will hardly determine how much contamination from Koppers our children are exposed to each day as they sit in school. I hope I don’t need to remind you that children are far more vulnerable to the effects of indoor pollution than we adults. Alachua County agencies should act now by undertaking proper and thorough testing, and then follow through with all necessary actions based upon those detailed results. This is a matter of grave concern to us all. Our children are our most precious resource, and the future belongs to them. Alachua County parents deserve to know exactly what toxic hazards our children are being exposed to in their learning environment. As a parent and citizen of this county I demand, therefore, the immediate indoor testing of all schools within a 2-mile radius of the Cabot-Koppers Superfund site.